Is it just me, or are the first days of 2019 marching by super-fast? Maybe my perception of time flying by is due to the fact that I haven’t yet flipped over the last pages of our 2018 travels? So, one last look at 2018 before I close out a banner year for Lowe’s Travels! 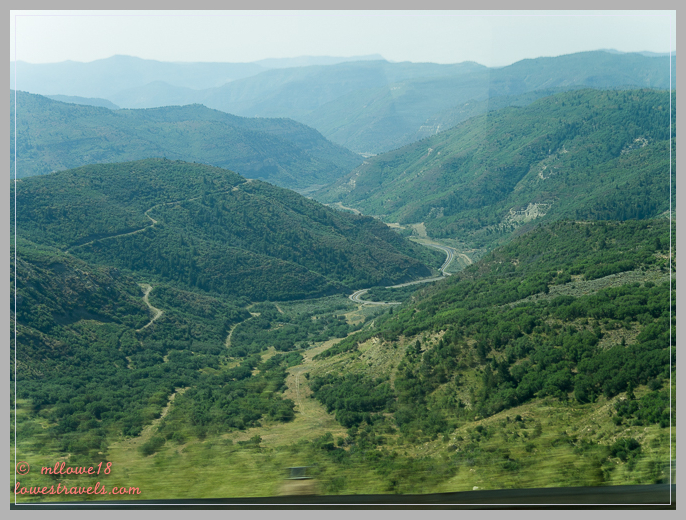 During the 7th year of our travel adventures we deviated somewhat from our usual north-south routes. 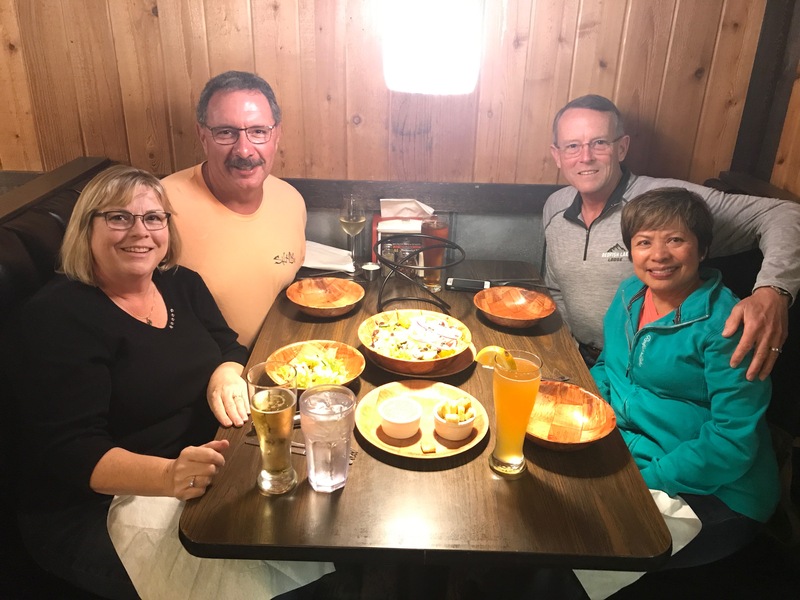 After heading north to visit areas of several western states we’ve missed in the past, we trekked back down to Albuquerque, New Mexico, and then pointed Betsy east one last time to experience several new places before wintering in Florida (seemingly with everyone else in the world!). We’ve driven many mountain passes during previous years, but that section of the western states on our map above were the most intense – verified by Betsy’s fuel economy. We negotiated many switchback turns on 4-7% grades in Idaho, Oregon and Colorado. 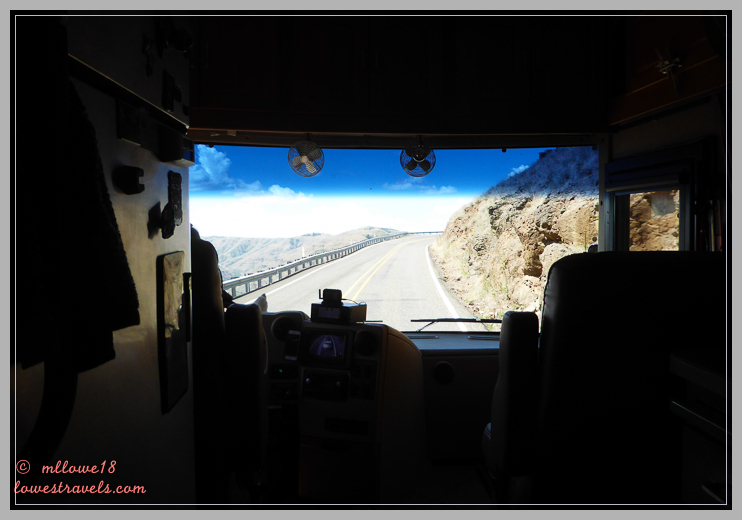 Some notable ones were Douglass Pass at 8,268′ and Lizard Head Pass at 10,222′ in Colorado, Rattlesnake Pass at 7,513′ near the Oregon/Washington border and Galena Summit in Idaho at 8,701′. There were many thrilling moments for me and my camera, with Steve missing most of them as he white-knuckled up and down the mountains. And Betsy performed flawlessly – yay! Taking a break at 8,701′ Galena Summit, my honeybunch cleans my side of the windshield for better photos – isn’t he sweet? 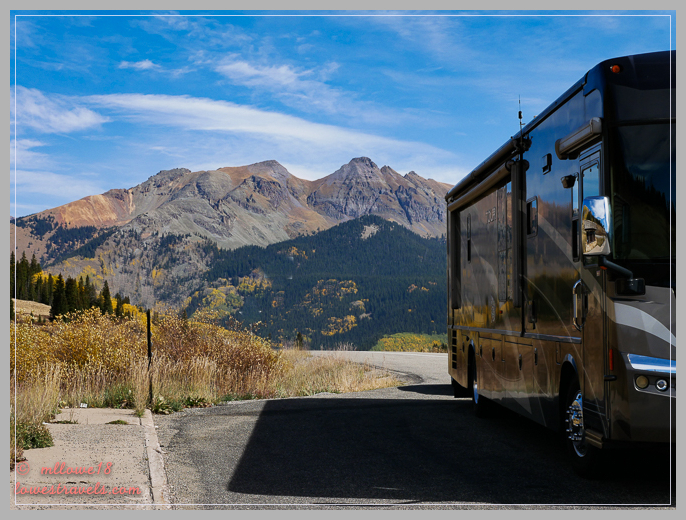 Betsy (and Steve) take a break at 10,222′ Lizard Head Pass – so beautiful! The last three months of 2018 were by far the worst for rain we’ve experienced while traveling. 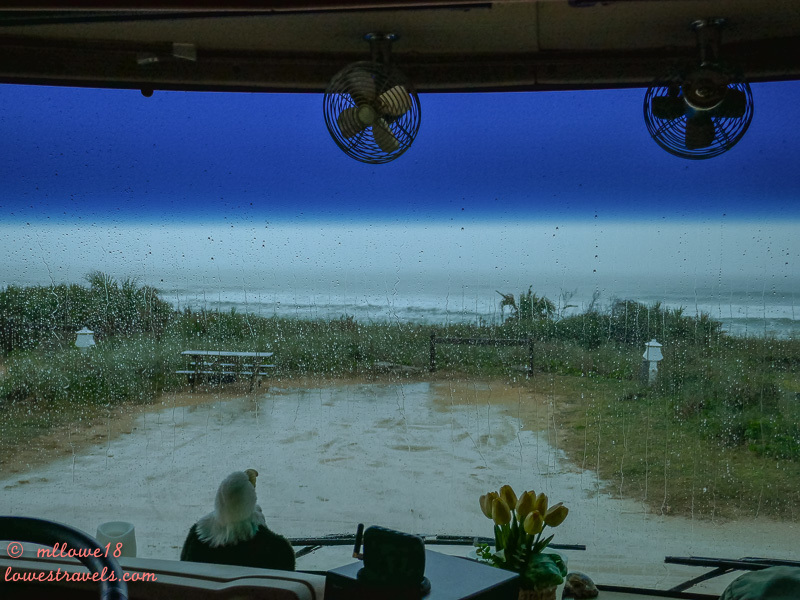 From Durango, Colorado all the way to Sebastian, Florida we were inundated with severe weather – torrential rains with flash flood warnings, tornado watches and freeze warnings thrown in for extra excitement. Steve was feeling guilty that he had requested this trip back east, but we made it with nothing more than a few lost dollars due to plan changes and a very dirty Betsy. 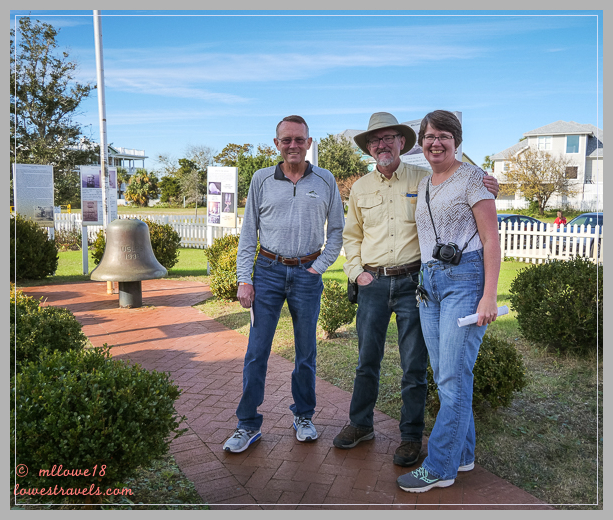 While visiting Tybee Island Light Station in Georgia, I heard someone call my name, and it turned out that Ed and Sharon had recognized us from our blog. AND we have friends in common with them – Bob and Dee Dee from Washington state! We’re hoping to get up that way next summer so we can all get together. 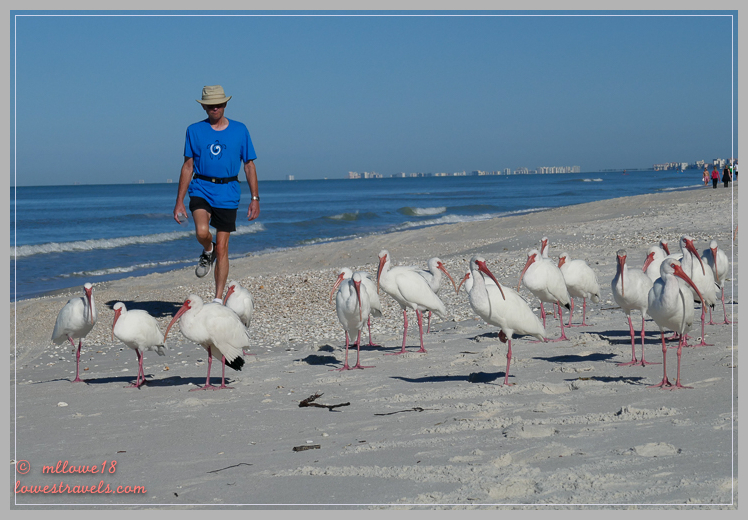 Steve got a surprise of his own as he took a walk at Ortona COE Campground near LaBelle, Florida. Shawn of Shifting Gears recognized Steve from our blog, and when I returned from my holiday trip to Las Vegas we got together with Shawn and Kim for a nice chat at their RV. Amazing! 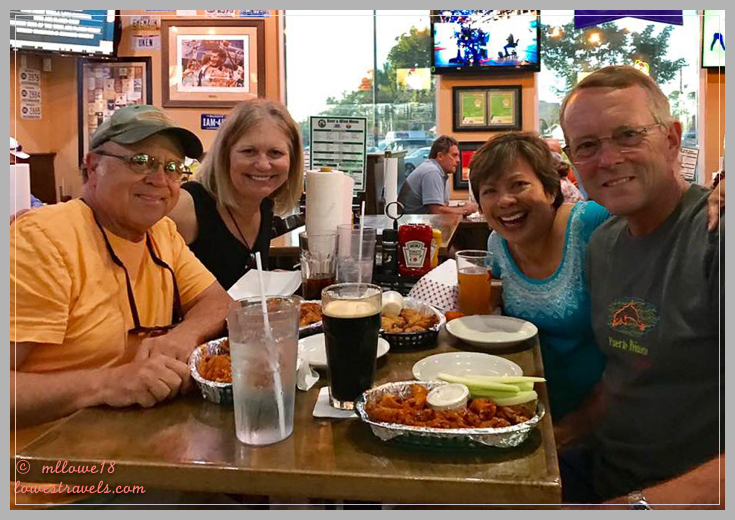 We’ve followed David and Sherry since 2014 when they were in Florida, so it was fitting that we finally met them in the sunshine state, even if it took four years to happen! Jim and Diana were at the right place and at the right time when I met them in 2017. They were there for me when I was stressed out as Steve underwent his cancer surgery in Tucson. Fast-forward a year and a half, and Steve finally got to meet these great folks who were my comforters back then. Flying to Tucson every three months was a drag for Steve, but his checkups were all cancer-free. It was a year of good health for me as well, and while in Colorado we enjoyed five weeks of the most intense hiking we’ve ever done. It’s all good! Hello Atlantic ocean, I’m feeling great! 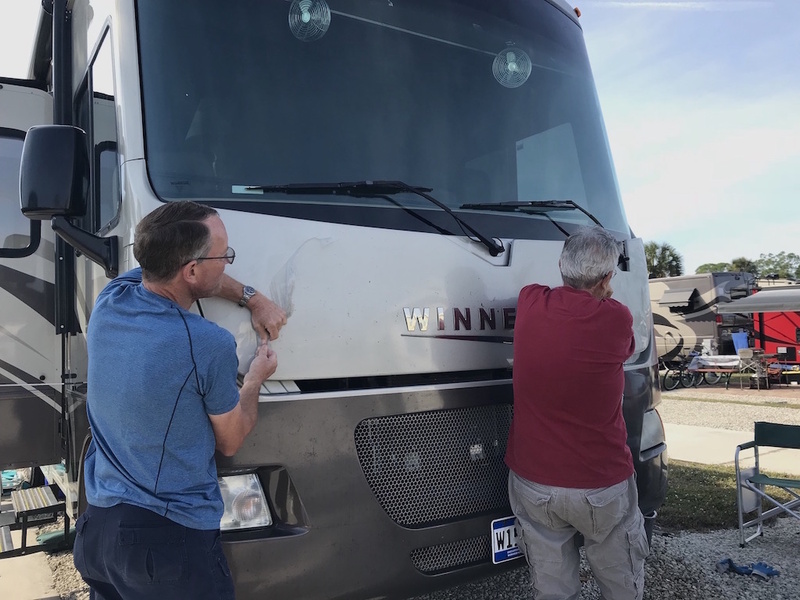 To all of our friends who’ve been along for the ride – from armchairs in your home or your RV – thank you for continuing the journey with us, as you definitely helped to make 2018 a banner year in our travels! 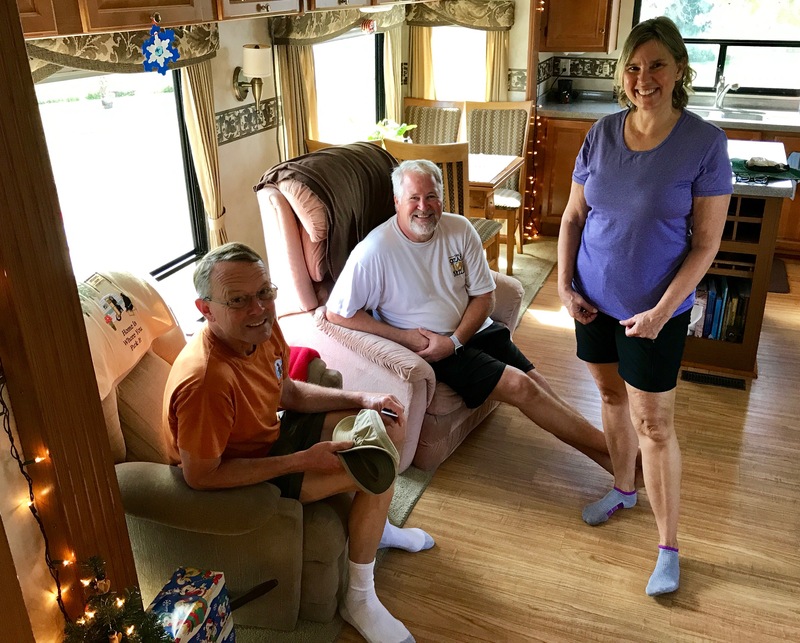 We’re currently settled in at our first winter digs in Naples, FL at Lake San Marino RV Resort. Although we’re not very happy with the park, it’s an OK place to pause for a month as we catch up on several annual cleaning and maintenance projects. 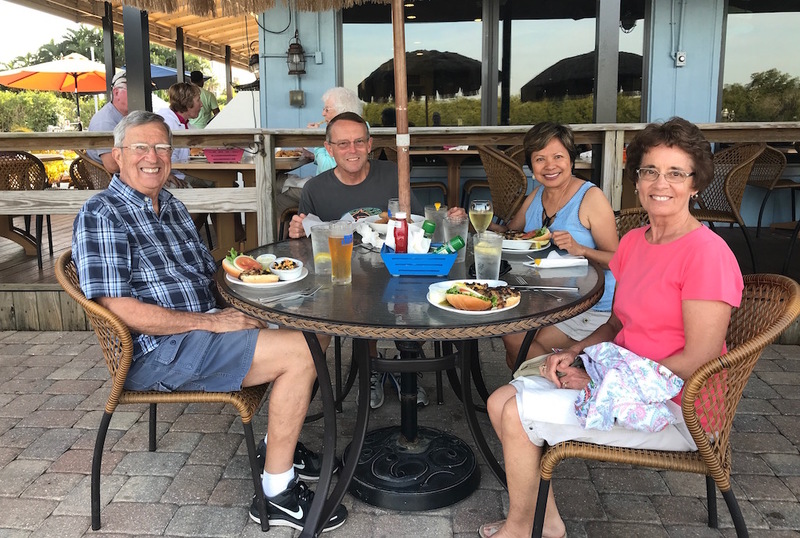 And with good friends nearby to spend time with as we walk the beaches and gorge ourselves on delicious fresh seafood, we can’t complain. Even the weather is cooperating now, so maybe Steve’s idea to come back here wasn’t bad after all! I’m sure the resident birdies are thinking, “who’s this fool”? On the gulf coast, it’s shells, shells everywhere! 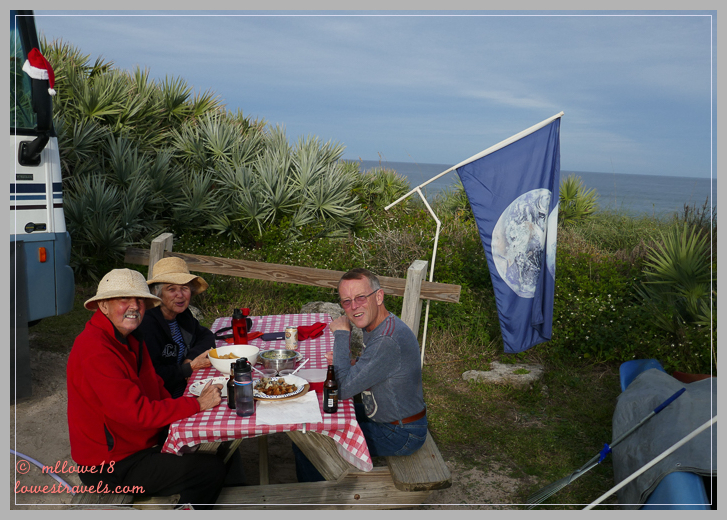 With Joe and Judy from North Carolina – yummy grouper sandwiches! 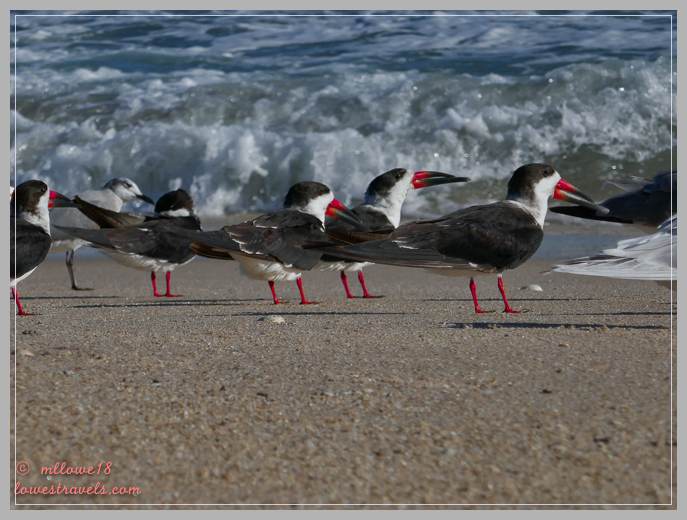 After a month here we’ll begin our slow migration back west, stopping in Tucson again in late April. After that our plans are open, but we’ll likely be staying in the western states during the rest of our 2019 travels. We look forward to seeing many of our friends there again! For now we’re committed to some serious beach time! Have a great new year, y’all! Boo to the weather you experienced in 2018 but yay to good health for you both. Here’s to lots more of that and some great adventures in 2019. Looks like a fabulous year, yeah for Steve being cancer free and your continued good health. May have to think our meetup as Eastbank is closed not only because of the shutdown but still trying to recover from hurricane damage. We have to make a meetup work though, we have fishheads in the freezer. I know the fall weather was tough, but I’m glad to see you finally having fun in the sunshine! You aren’t missing all that much in Tucson, I can tell you that. Lots of chilly days, rain, and even some snow. Blech. We handled a couple big mountain passes in Colorado this year and they were intense. I’m not looking forward to more, but I guess that’s the price we all have to pay to see these stunning vistas. Have fun with all your socializing in the sunshine state! Happy New Year! 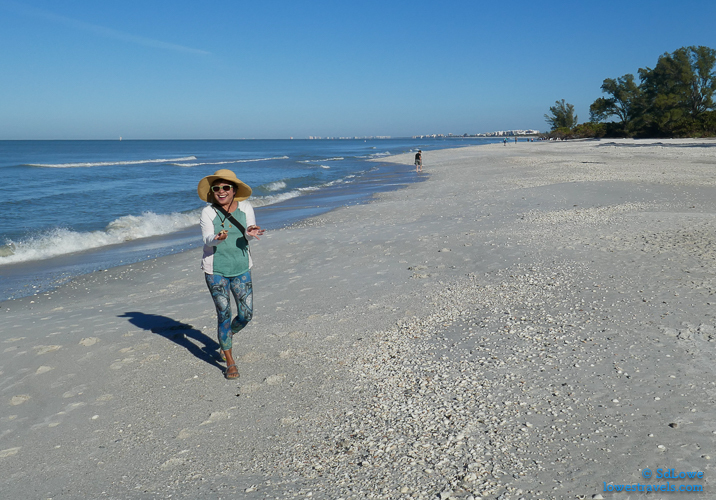 Thank you, Laura, we are definitely enjoying the Florida sunshine! The past days had been gorgeous, low humidity and just wonderful. 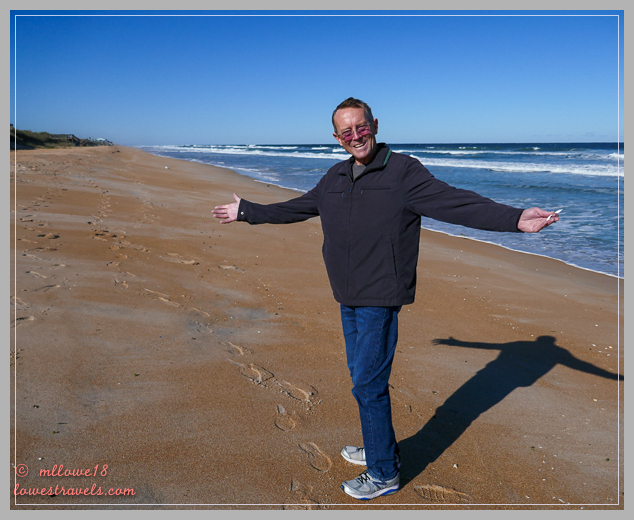 Perhaps Steve may have made the right call, by revisiting the east coast 🙂 If there are lots of rain in southwest AZ this winter then we will be enjoying all the spring blooms come May! You did have the worst traveling weather this fall. Since John doesn’t drive in the rain, we would still be waiting in the west to start east…haha! 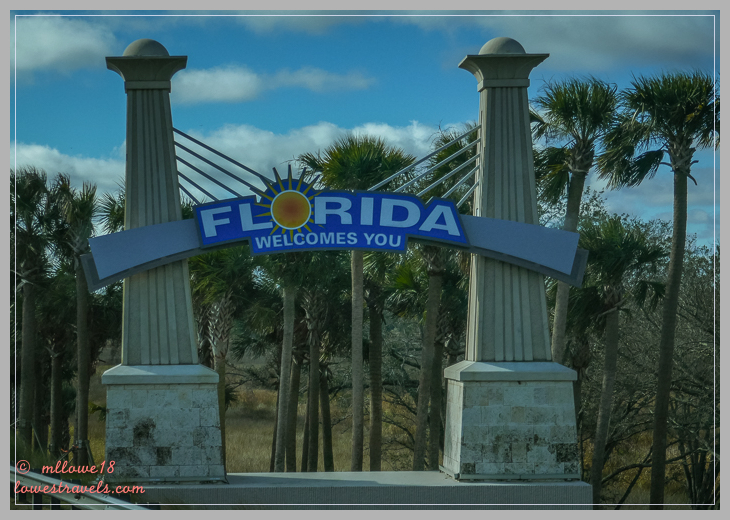 Glad to see that Florida has finally greeted you with sunshine and warm temps. You two certainly deserve it. It is always such great news to hear Steve’s check ups went well. Hopefully, we can meet up in the west in 2019. Enjoy the rest of your month in Florida. It was so nice to spend some time with you guys. Please tell Steve I finished the book he lent me. I found it very interesting. Have an awesome new year! We wished too a good year for you and Kim and maybe a new boat ? What a fabulous picture of Douglas Pass. I can imagine Steve’s white knuckles. Love your map. Wish I knew how to do one like it. That picture at Gamble is sad. So sorry you had so much rain. We had two wonderful weeks there twice with only a day or two of rain. 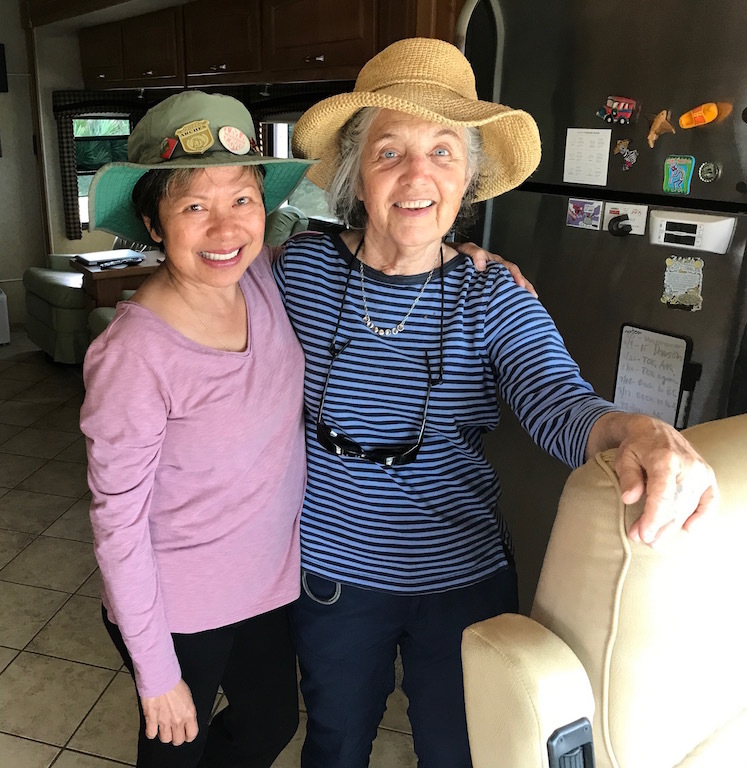 Love us in our hats! Also love that picture of Steve feeling great. Nothing is more precious than that. You have definitely met up with a lot of friends this year. Hope you had some of those blue crabs. Being from the mid Atlantic they are my favorites. Wishing you and Steve a wonderful 2019 with perfect health. Thank you Sherry! I sure had a great time with you and wished we had more days to hike or walk somewhere. although I wont volunteer to get up at dawn and enjoy the sunrises. I will just savor it from your captures. I hope you guys travel west this year! Happy New Year! Now that we’re back in the US, hopefully I’ll be able to stay on top of my blog reading. Enjoy the rest and when you get back on the road, safe travels. Good to see you both in some sunshine. Fall was a rainy one, everywhere we all went, but it’s over now! So happy that Steve’s check ups have been A-OK, what a weight lifted. 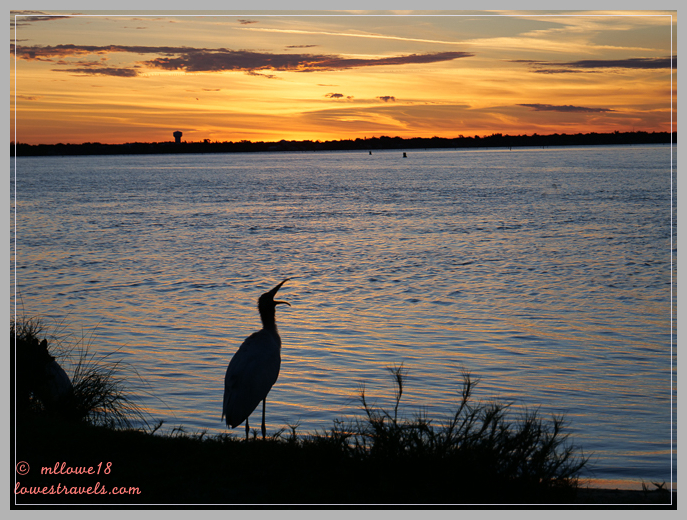 Looking forward to a wonderful, healthy, sunny new year and the crossing of paths along the way. It’s about time the weather decided to cooperate with you! Hope to see you in Prescott some time this year! Prescott could be our next stop after our Tucson stops for DR appts this spring. Would love to see your new digs. So happy to see the weather is finally shining on you. 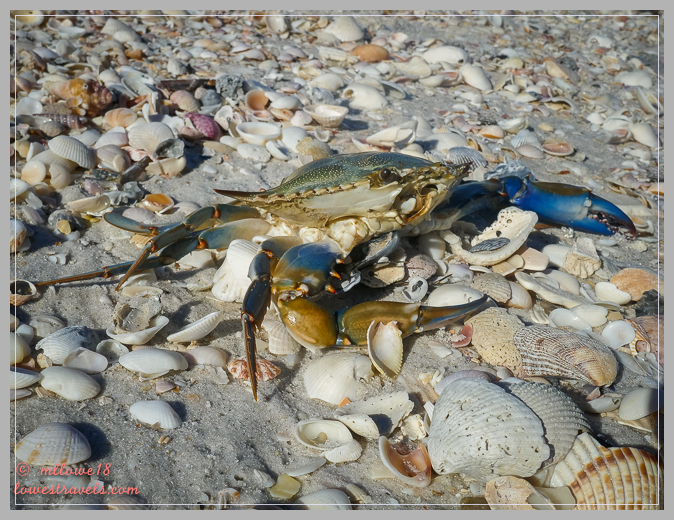 You look quintessentially “Florida” in your shell-collecting photo! Thanks for the list of mountain passes to avoid. 😆 We could not be more opposite in that you like to look out and take photos of the scary heights. Yikes! I hope the rest of your SE stay is only as eventful as you want it to be, and your trek back west is smooth. Hopefully, we will cross travels in 2019! Wow, you guys covered a lot of diverse territory in 2018! Such a bummer that you had such terrible weather for the last three months of the year, but it looks idyllic where you are now with those beautiful beaches and sunshine. You two look happy. 🙂 Here’s to a wonderful 2019 for you both, filled with good health, grand adventures, good friends, and good weather! Can’t wait to see you in Florida! Indeed the last three months of the year was nasty, it was our rainest year ever. Southwest FL so far has given us what we were longing for, sunshine and lots of it and low humidity was even thrown with it. yeah! Another fabulous post!!! We’ve followed you two since our beginnings five plus years ago. Sadly, we’re getting off the road. Today we deliver our beautiful Tiffany into the arms of another couple ready to take her into their soon to be new full time lifestyle . This is a perfect post to also pass onto them! We’re also encouraging them to some how blog along the way!